UNITED NATIONS (CNN) -- Libyan leader Moammar Gadhafi on Wednesday delivered a lengthy, rambling address in his first appearance before the United Nations -- slamming both the U.N. Security Council and the United States. 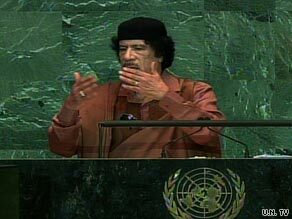 Libyan leader Moammar Gadhafi addresses the U.N. General Assembly on Wednesday. He broached conspiracy theories, urged probes into U.S. military activities, and took aim at the structure and the actions of the Security Council, in a one-hour and 36-minute speech at the U.N. General Assembly's annual session. Gadhafi called for world unity in confronting various world crises, such as climate change and food shortages, but he aimed his ire at the world body and the United States. Dressed in a traditional Libyan cap and robe, he elaborated on what he believes is the unfairness of the structure of the U.N. Security Council, which has five permanent members -- the United States, Russia, China, France and Britain, each with veto power. Called for abolishing the Security Council in favor of the General Assembly, which would become a "world parliament." Said the Security Council should be called the "terror council" and that nobody should accept the resolutions of the UNSC going forward. Said the United Nations headquarters be moved outside the New York so that everyone doesn't have to deal with the U.S. security. Suggested it is moved to China or India. Called for former Panama dictator Manuel Noriega to be released and all the documents of his case re-examined. Called the H1N1 "swine flu" virus a military tool and a weapon of proliferation. Called U.S. President Barack Obama "my son," and congratulated him for his first U.N. General Assembly, but indirectly criticized him for giving a speech and walking out. Said the Taliban should be able to form an Islamic emirate and not be designated an "enemy." Called for a re-opening of the President John F. Kennedy assassination files because his murder was related to non-proliferation and also files on the assassination of Martin Luther King, because he said it was a plot. Renewed his call for "Isratine," one state made up of all Israelis and Palestinians, including refugees.